Lighting a room is always a challenge. The old good incandescent light bulb gives great light but wastes amazing amounts of energy and lets face it, you can hardly find it anywhere for sale anymore. The LED light is an amazing way to save energy but there is still plenty of debate about its health effects, especially on the circadian cycle. Other forms of light fall between these two categories of energy efficiency and unclear health hazards. Well, basically that leaves one form of light to be extremely cheap and healthy – sunlight. Though still a challenge to bring light into a dark room during the night, the technology of bringing it in during the day through Skylights and solar tubes has developed immensely in the last years while prices went down. Skylights and solar tubes can direct sunlight down inside from the roof of the building, but their effectiveness diminishes as the sun moves across the sky, especially in the winter, when the sun is at a lower angle. However, by using a system of moveable mirrors, which are directed by a solar-powered GPS device, inside a skylight, natural daylight can be brought into a building virtually all day long, giving workers or residents the benefit of not just free lighting, but the natural richness of the sun's rays. The difference between the passive day lighting systems (such as a conventional skylight or windows), and active day lighting systems, such as the SunTracker from Ciralight, is that instead of having some points throughout the day when the daylight is low, or other points when the light is glaring, they provide not only even lighting throughout the day, but they do so at a bright enough level that electric lighting can be turned off in many cases. 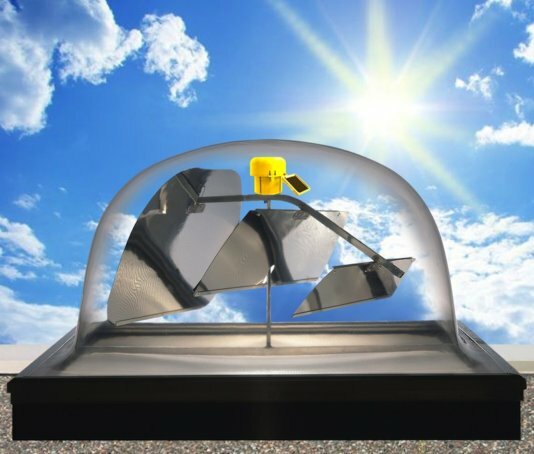 At the heart of the SunTracker system, a series of three mirrors, mounted to a moving frame under a polycarbonate dome, direct sunlight down through a diffusion lens (which distributes the sunlight instead of focusing it on a single point) into the building. An attached solar-powered GPS controller determines the exact location of the unit in relation to the sun, and keeps the mirror array angled to the sun throughout the day (also using solar energy), allowing it to direct the maximum amount of daylight from just after sunrise to just before sunset. According to Ciralight, SunTrackers will deliver up to 300% more sunlight than passive skylights, which could make the difference between having to use electric lighting or not during the day. The price starts at 895 dollars per unit, but according to this video by the company, the benefits outweigh the costs.